It snowed again. It seems we're making up for our lack of snow in early winter by getting a little bit every other day now. At least it's been light and fluffy and easy to clean. And I have a short commute to work so I can't complain too much! I decided even with the snow and the cold today that I haven't worn my favorite dress in ages so I just felt the need to wear it today. It's pretty warm, especially after adding this nice warm sweater from my cousin. I always feel somewhat elf-like when I wear these boots. I'm not sure why, other than they're short. The toe isn't that pointy in them. Yet, I just feel a bit like an elf. But, hey, they're comfy, so they have that going for them! They got a little coated in snow as I was setting up my camera this morning. Such an exciting post today. I guess the coffee hasn't quite kicked in yet! Is it snowy where you are? We had snow last night also....back to heavy coats and woolly scarves today:) Cute dress Beth! It's been snowing for us at least every couple of days too. I am so over snow already! The only upside is boots, lol. That is such a cute dress! 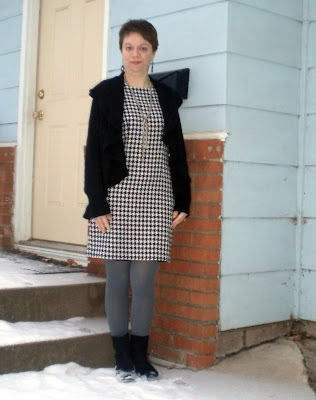 I love the houndstooth! I keep waking up to snow too. Luckily it's only been around an inch every day. Very cute dress dear! And it looks great with that sweater! Is it snowy where I am? Is it snowy where I am? Bethie, silly Q! I love your outfit today; cute, trendy and comfy yet dressy. The sweater makes it. request: close ups? I want to see the necklace in detail!!!! Bethie, I am snarky today because I had tech difficulties with Photobucket last night that sent me screaming into the next room. Sorry, You please have a pleasant and perky day, okay? (hug) to you!!! We haven't seen a speck of snow yet this year! It's a little grey today, but otherwise fine. And very good of you to not complain about the snow because of the short commute. I take the bus so technically, I can't complain... but I do anyway! Stupid snow. Go away. Grr. Oooh the ruffled sweater is perfection with the houndstooth dress! We have gotten a little snow, but today was in the mid-50s and very sunny. I loved it. I don't envy you the snow. I am very jealous of your dress. I love black and white houndstooth so much! I wish we could see more of your cardi- it looks super pretty. That dress is really cute. I am totally willing to complain about the snow, mostly because I am tired of winter. oooooh! I love the little elven boot look! You are full of snow chic! Love the dress and the long lean lines created by the tights. Great snow pics! Love this dress! I am on the lookout for something similar in Houndstooth.